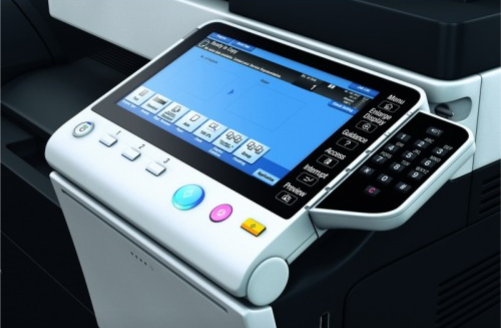 The school has a number of Konica Minolta Bizhub 500 bulk printers located around the school, which can be accessed remotely, either on or off site. Below are some simple instructions to guide you through the process of queueing print jobs to the printer of your choice, to be collected at a time convenient to you. If you are a visitor to the school site using your own laptop or tablet with Windows 7+, you can connect to the Powys BYOD wifi and then follow the instructions below. In your browser, type the following URL: https://papercut-crickhs.msappproxy.net. This will bring up a dialogue box into which you type your school username and password. A new dialogue box will appear with the correct information in the various fields. If you would like to check whether the correct Card / ID Number has been entered, click on show. It might also be a good idea to check that your account has funds available by clicking on See shared accounts. Now click on Web Print in the left hand bar. You’re ready to upload the file you wish to print. Please note that documentation files must be in pdf format. Picture files can be in either bmp, dib, gif, jfif, jif, jpe, jpeg, jpg, png, tif or tiff formats. You can also use this dialogue box to check whether you already have any items in the print queue. Select the number of copies you would like and the account to be charged, if not already showing. If you would like to check that your printing is going to the correct printer, click Printer Selection. The correct printer should automatically be selected but if not, select it from the drop down menu. Click Print Options and Account Selection to return to the previous screen and click Upload documents. You can now either drag and drop a file into the space provided or click Upload from computer. Once selected, the file will appear on the screen. If you accidentally upload the wrong file format, an error message will appear at the top of the screen. You can remove the uploaded file by clicking remove. Now click Upload & Complete. At this point you’ll be given the option of cancelling the print job. If you choose to continue, a green tick will appear beside your document and you’ll then be directed to the active print jobs screen. You can see that your print job is queued to the printer. If you would like to change the printer selected, click Held in a queue. Click Print in the Action column. Select the printer you want and click on the Back button to take you to the previous screen. You can also cancel your print job at this point by clicking Cancel in the Action column. Walk to the printer, log in as usual and collect your printing. Job done!